Designed for on- and off-road applications and free-rolling axle use in challenging road conditions, the AM06 is built for aggressive traction in all driving conditions. The square shoulder shape and contact pressure yield superior wear resistance while the surface grooves provide excellent water drainage. 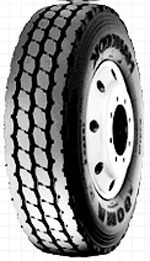 Tread design expels stones and extends the life of the tire.